Present data visually in vector spider charts for better effect. Gain professional-looking spider charts in less than 5 minutes even without drawing skill. Regarding to data presentation, showing the number without analysis may be meaningless most of the time. 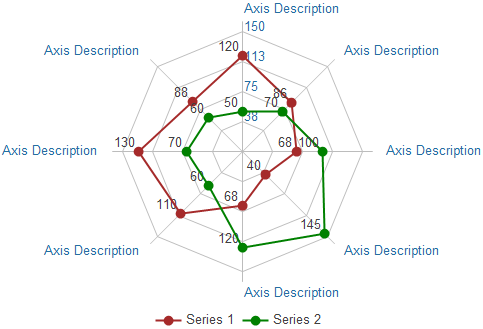 When you need to compare the aggregate values of multiple data series, you can use a spider chart (radar chart) to show it in a visual and understandable way. Spider and spider with markers. 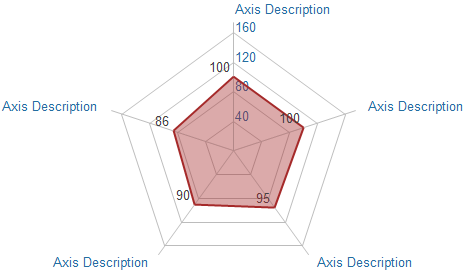 With or without markers for individual data points, radar charts display changes in values relative to a center point. Filled spider. In a filled spider chart, the area covered by a data series is filled with a color. Different series are filled with different colors. 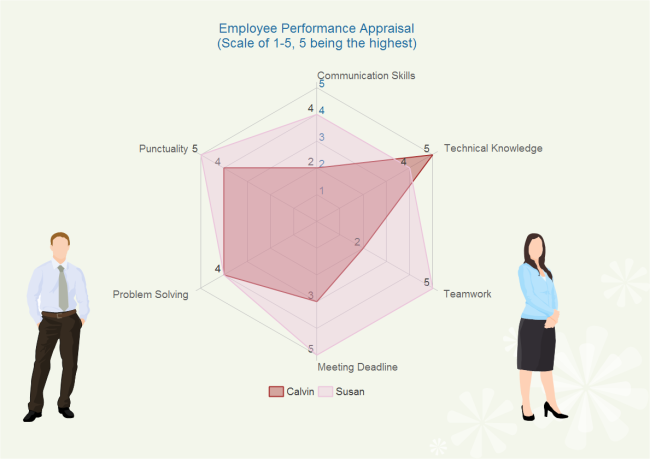 A spider chart can come in handy in the appraisal and review process of employees' performance. Here is an example appraising two employees' performance from the perspectives of Communication skills, punctuality, problem solving, meeting deadline, teamwork and technical knowledge. As shown by the above spider chart, HR managers can visualize employee performance data, based on rankings offered by their respective seniors, on a single chart. This is very beneficial for HR management. This chart can also be applied to plan employee training by grouping employees who lack a particular skill set (low in rank) and then designing suitable remedial procedures for the group. Companies or consumers can use spider charts to compare products in terms of functions to highlight one product or choose the best product respectively. Let's say you want to compare 2 brands of smart phones over features like Battery, Camera, Display and Memory. Spider chart helps you get to know which brand is better when it comes to your most desired feature. The sellers or salesmen can draw a spider chart to compare sales data of different goods. In this way, the most popular kind of goods can be figured out. Creating spider chart in MS Excel is time-consuming. Actually, you can do it in automatic diagramming software effortlessly. Edraw is such a smart tool that has taken many hassles out of making spider chart. Users just need to do some simple operations. To get detailed help, please go to this link: how to edit spider charts. You can also get things done quickly by leveraging the spider chart templates.